Baddies stands at Bloor and Lansdowne just steps from the entrance to Lansdowne subway station, where for long there was only an odd assortment of very casual cafes and restaurants such as Mamaland , Toronto Coffee and Tea House , and Curry Kitchen . Other brunch options like Starving Artist and Hello Darling exist nearby, but nothing is quite like this. Owner Alex White moved here from Australia four and a half years ago, and now lives at Lansdowne and Davenport. 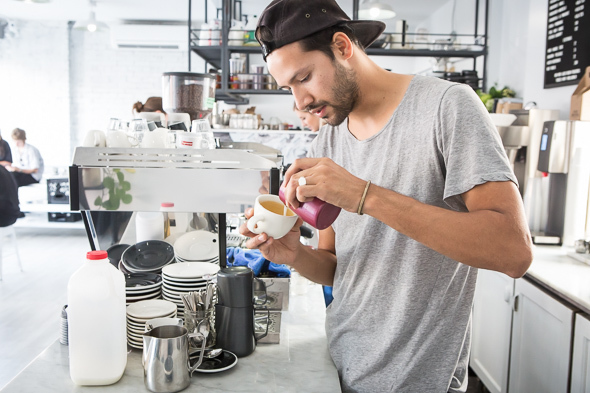 His previous barista experience includes stints at cafes like Dark Horse and Early Bird . 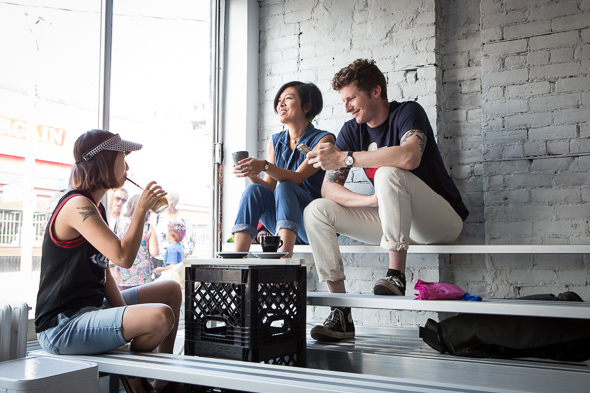 According to him the coffee and breakfast scene in Australia is much more intense, and he wanted to bring that seriousness and passion to Toronto breakfast. 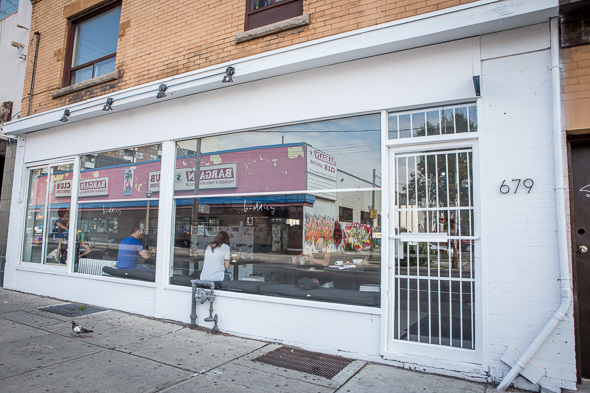 With giant windows facing the street that subway goers coming from Bloor have to walk past, but white bars on the door, Baddies is at once imposing and inviting. 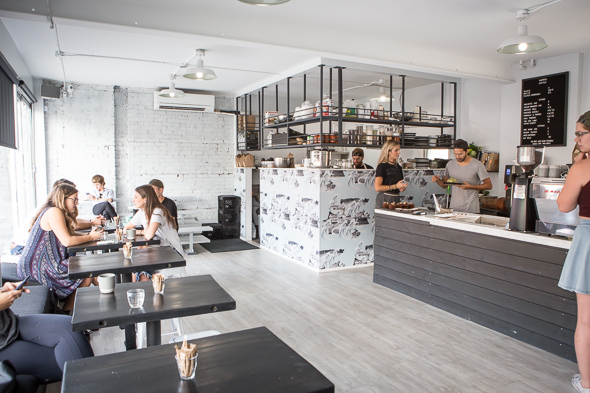 Marble countertops and custom wallpaper dominate the space, and a set of bleachers sits against one wall, where the "baddies" or bad kids at school stereotypically hang, but set right into the cafe. 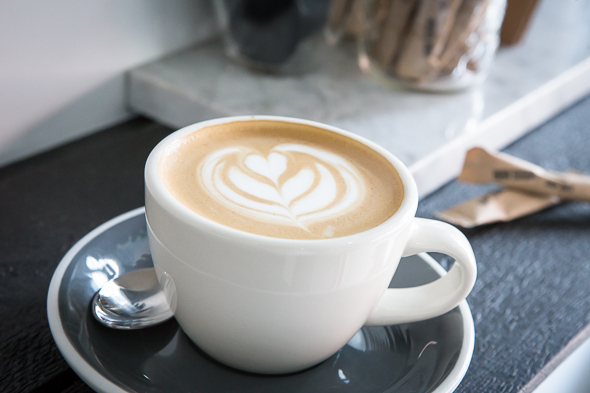 Baddies sets themselves apart with stunning food and incredible coffee, the latter of which is all supplied by 49th Parallel. The coffee options are just written on the menu as "black" ($3), "white" ($3.5/$4) or regular filter (just $2.50). 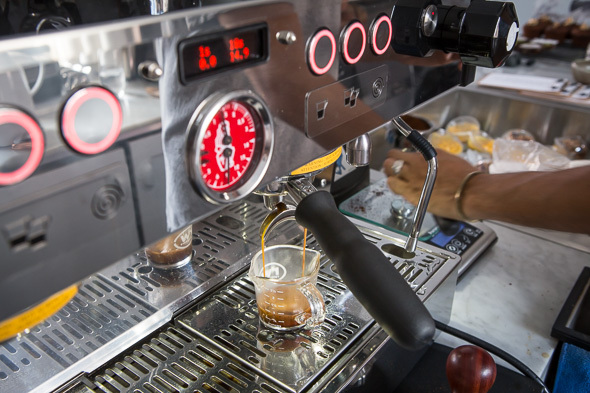 In a coffee scene increasingly dominated by espresso only drinks that can be pricey, White's appreciation for simple filter is a major plus. 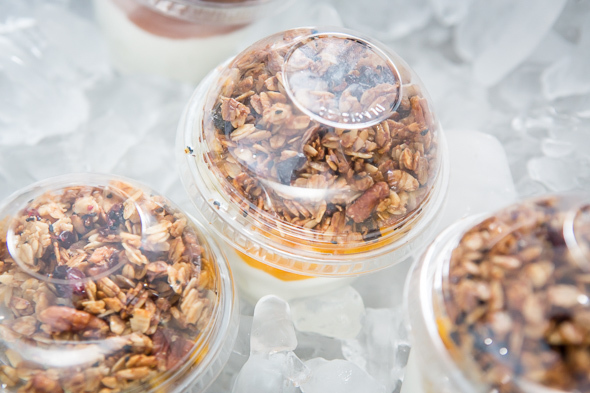 In a chest freezer set into the counter they have a variety of to-go breakfasts like bircher muesli, granola yogurt, and chia pudding (all $4.50 - $7.50). 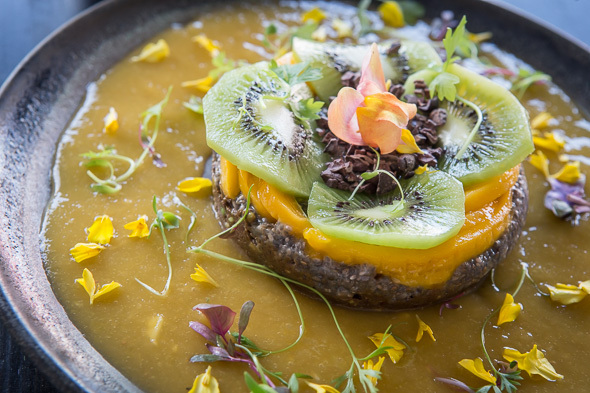 You can also order the pudding, for example, as a dine-in option, which is worth it for the presentation alone if not for the rich chocolate pudding, juicy seasonal fruits, and textured chia seeds, not to mention the good feeling you'll get from knowing there's some healthy stuff in there. 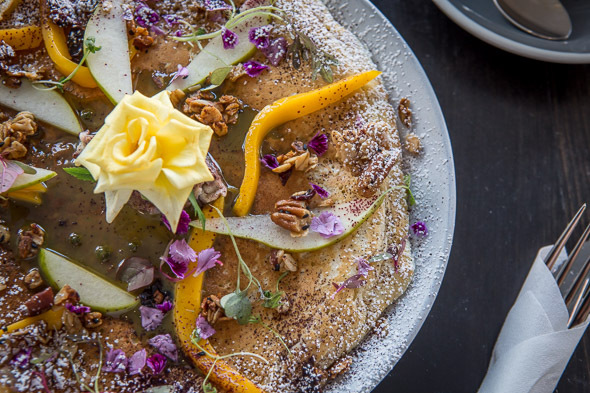 The hot cake ($10) is another visual stunner, a vanilla bean pancake topped with seasonal fruits like pear and mango and garnished with edible flowers. It's topped with matcha caramel, a dollop of house churned butter you should make sure to spread all over the cake, and scattered over it are little granola chunks. 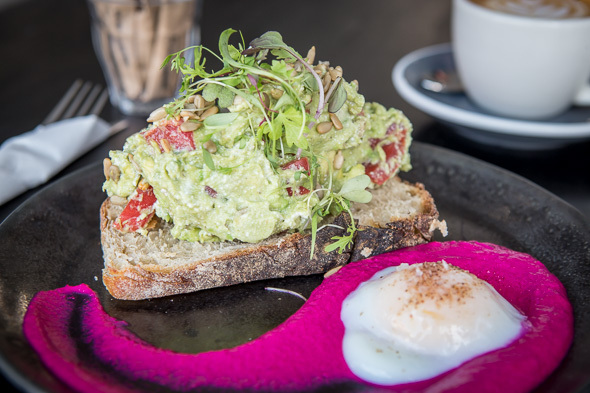 A standard dish that Baddies has really elevated is their smashed avo ($9). It's a hunk of sourdough toast from Prairie Boy heaped with a mountain of chunks of avocado and diced heirloom tomato and topped with sunflower seeds and microgreens. It's served with a beet and Macedonian feta puree that is to die for, and in the midst of that sits a perfectly gelid sous-vide egg. Beware though, fellow brunchers: they're closed Sundays.